Not all suffering is meant to be embraced. I know that may seem like an odd declaration to make. But I’ve recently come from a tradition which looks at things pretty differently from most corners of Christendom. In the circles I’ve been running in the last few years, suffering is seen as a doorway to a deeper relationship with God. Those who have influenced me most make much of the daily work of the cross in the life of a believer. For what it’s worth, I’m convinced there are clear scriptural reasons for seeing suffering as a way to grow faith and dependence on God. I must also say that you can easily go overboard with this idea. There are those among us, in fact, who naturally gravitate towards dark expectations. Some of us slip easily into fear and dread of God’s next move in our lives, and that’s not the way he wants us to relate to him. I’m fairly sure of that. Some people, of course, don’t have to deal with this at all. If your theology has God in a reactionary position toward history/world events, then he’s never to blame for anything bad that happens. The world just does what it does and God takes what happens and makes good stuff happen out of it. Even then, of course, you have to grapple with the idea that God allows certain things to happen while he prevents some other things from happening. One way or another you still have to reckon with God’s level of involvement in the hard times. But a funny thing happens once you’ve decided you believe in a totally sovereign God: You feel the need to make sense out of everything that happens, because everything ultimately is in his control. For the record, I think the sovereign view matches the views of the key players in the Bible better than the reactionary view. Those people had astounding things to say about God’s absolute power over even the littlest details of our lives. But then you have to reconcile a belief in a good and loving God with all the terrible things that happen in life. Thus we have the age-old problem of evil, and I’m not gonna try to resolve that one, thank you. There is, however, an additional problem that develops once you’ve embraced Jesus’ call to take up your cross and suffer for his name’s sake. You start to think all suffering is somehow for his name’s sake. You think every hardship is “the cross.” But it’s not. Some suffering is just wrong and needs to be resisted or overcome. Or maybe it’s not wrong — maybe it’s just more fallout from the world being the way it is. Either way, nothing says you have to just shrug your shoulders and say, “God wills it.” When you get a headache, you take something for it, don’t you? When you get an infection, you take antibiotics. That doesn’t mean you don’t have faith. It just means you intend to use the good sense that God gave you to solve a problem. I trust that’s exactly what God wills for you to do. Well, like most questions of biblical interpretation, your best bet is to start by asking what it meant in its original context. What did that sentence mean to the people who first heard it? Once we answer that question, then we can start to figure out what it means to us today. The answer is that Jesus wanted his followers to know that following him meant they would encounter the same response from the world that he would encounter. In fact, many of those original followers met with an untimely death at the hands of the very same people who rejected Jesus. His warning proved true. Beyond that, many who followed him came to sacrifice other things for his name as well: food, shelter, warmth, safety, financial stability, family loyalties, you name it. For example, Paul spent most of his later life traveling the Empire, preaching the gospel and getting beaten for it. For him, the cross meant a really hard life. But it was purposive. These people who were suffering knew that what they were doing was serving the cause of Christ. That’s what enabled them to press on through their hardships. They endured their trials because they knew it was accomplishing something redemptive. It was constructive suffering. When you look at it that way, a cross makes much more sense. It’s not just any random hardship. It’s suffering for someone else’s sake. It was for the joy set before him that Jesus endured the cross. There was a goal. There was a redemptive end to his pain and suffering. And there was a resurrection on the other side of his dying. Now don’t get me wrong: That knowledge doesn’t remove the pain. Jesus asked that this cup pass from him because it was still more than any mortal could bear. But he ultimately embraced it because there was something waiting for him on the other side. That something was us. That boggles my mind. But that’s what the New Testament says. But that’s not my point right now. My point is that not all dying results in resurrection. And some suffering is not purposive. Sometimes difficult times come and you’re not supposed to just lie down and let it roll over you, saying “God wills it.” In our attempt to embrace the work of our own personal crosses in our daily lives we must not slip into that crazy place where every bad thing is called good, or every wrong thing is called right. The cross is about enduring the shame of being rejected by a world that rejected Jesus, too. It’s about enduring hardship whenever it serves a redemptive end for the sake of the gospel. And sure, a whole lotta things can fall into that category, but some of us go a little crazy with this. We take everything anyone does to us, including the dumb things we do to our own selves, and we say that anything bad that happens is just the cross. No, it’s not. That was never Jesus’ intention when he called us to follow him and take up our cross. 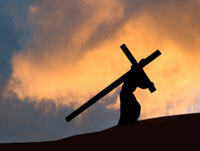 The cross is a purposeful embracing of hardship for the sake of loving God and loving one another. It’s ultimately productive. It bears fruit. It brings life, in the end. So let THAT be your yardstick from now on. Does it produce life in someone else for you to embrace whatever it is that you’re trying to embrace? Or does it just make you an even more difficult person to be around? Does it make you feel like you’re a pitiable victim, a doomed scapegoat for other people’s faults? Chances are, if that’s how it affects you, it’s not accomplishing what you think it’s accomplishing. If it just makes you a cranky, dismal person, please just say “NO.” That’s not a cross. But if it communicates love to God’s people, and if it produces fruit in their lives, then isn’t it suddenly more worth it? Just stop and think for a second. Take a second look at what you’re up against, and act accordingly.